As preparation for the big reveal of my uncle Ernie Coffman's y-DNA, we will focus this week on Ernie's second great grandfather, William Fowler Coffman. He was born 30 July 1815 in Kentucky and died in Hancock County, Illinois on September 11, 1905. I took this photograph of his headstone in 1993. The stone appears to have been added much later than 1905. !BIRTH: 1815 Kentucky; "...William and Elizabeth (Wilson) Coffman [were] born in Kentucky [and] came when children with their parents to Illinois at so early a day that Indians were still plentiful in the state." per Historical Encyclopedia of Illinois & History of Hancock Co. Scofield Vol. 11; pg. 1186 Sketch of Aaron DeWitt. The source of this information was probably Sarah Coffman, daughter of Wm. F. Coffman and Elizabeth Wilson and wife of Aaron De Witt. !RESIDENCE:1818-1830 Jefferson County, Illinois; "When he was three years of age the family removed to Jefferson county, Illinois where they remained twelve years, when in 1830 they came to this vicinity where he has since resided" per obituary. !CHURCH: 1831; United with the Baptist church at New Hope in McDonough County at 16 years of age per obituary. !MARRIAGE: 1837; McDonough County Marriage License; COFFMAN, WILLIAM to WILSON, ELIZABETH 18 Dec 1837; Book A/Page 21 License 162 ; "They were married by the Rev. John Logan, a worthy Baptist divine and one of the earliest pioneer preachers in Illinois. " per wife's obituary. !RESIDENCE: 1838-1841 Illinois; Mary Jane b. IL 1838; Sarah b. IL abt 1841. !CENSUS: 1840; His father, Jacob Coffman and his brothers, Thomas and Leroy are in Nodaway Township, Buchanan County, Missouri in the 1840 census. He apparently followed them to Missouri in 1841. According to the story told by Alfred Coffman in his Sacramento County biography they were residing in Jamestown, five miles from St. Joseph. His actual location in 1840 is currently unknown. !RESIDENCE: 1841-1845 Missouri; daughter Julia was born in Andrew County, Missouri 13 November 1845. Andrew County is directly north of Buchanan County as shown in the image below. "In 1841 they removed to Missouri, but four years later returned to Illinois, resolved to make it their permanent home. " per wife's obituary. !CENSUS:1850; McDonough Co., IL;p.507, line 370;GS#007689. 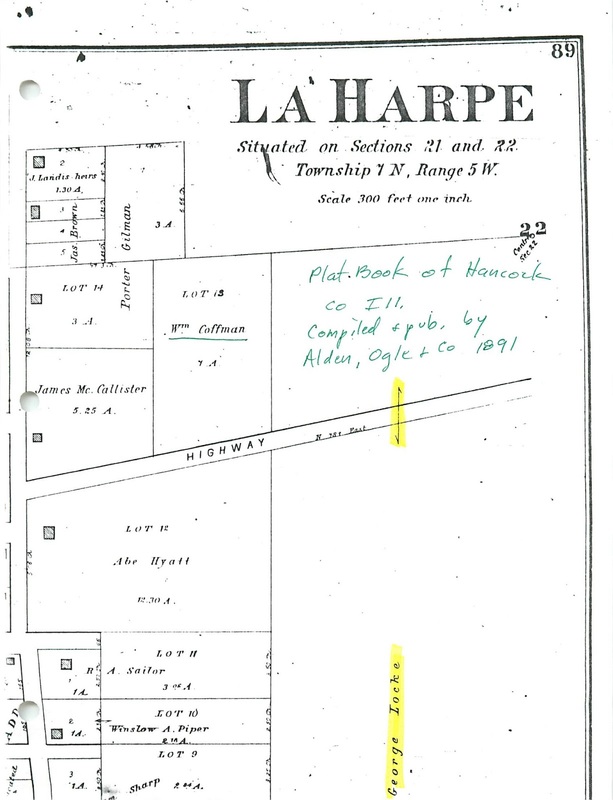 !LAND: 1850-1851; McDonough County, Illinois Land Records; The following series of land transactions appear to be related to Section 18, in the Northwest quarter of Township 7 Norther and Range 4 West; the first name is the grantor and the second name is the grantee. !CENSUS: 1855; Illinois State Census Collection, 1825-1865 http://www.ancestry.com about William Coffman Name: William Coffman Census Date: 1855 Residence State: Illinois Residence County: McDonough Residence Township: Township 7 Roll: ILSC_2192 Line: 14; The listing shows William and Alfred Coffman residing in Township 7 North, Range 4 West. The tick marks show the following listing. The names and ages have been inserted for comparison purposes. The listings and tick marks show one male under 10 [Archibald, age 5]; one male 30 to 40 [William, the father 40]; four females 10 to 20 [Mary Jane 17, Sarah 13, Eary Ettna 12, Julia Ann 10]; one female 30 to 40 [Elizabeth, the mother 39]. !LAND-RESIDENCE: Durham Twp. Pioneers by Suzanne Miller; pg. 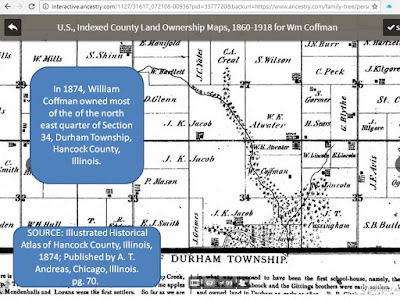 9 William Coffman owned land Section 34 Durham Twp. 1860's & 1870's. Wife Elizabeth. Children: Mary Jane, Sarah, Arietta, Julia, "Archibald, Luella, & Douglas. 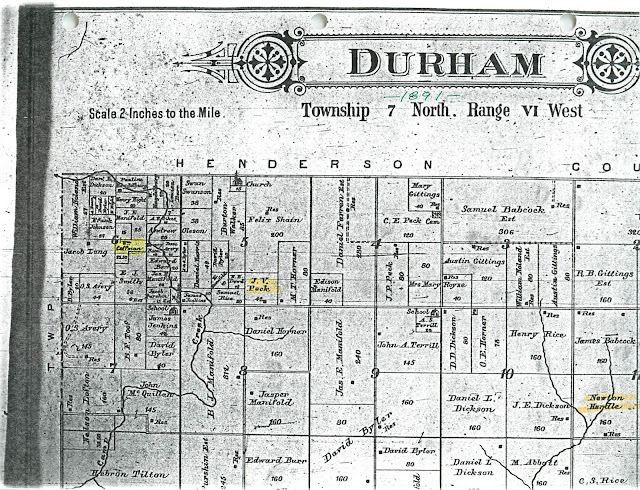 !CENSUS: 1870; a line by line search of Durham Township in 1870 failed to reveal William Coffman. 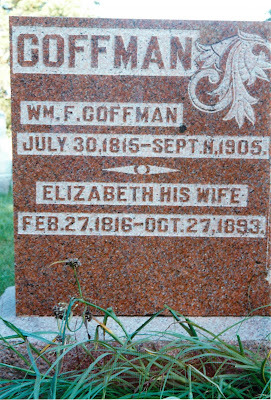 Perhaps the Coffman family was traveling in July 1870 or perhaps they were missed by the census enumerator. 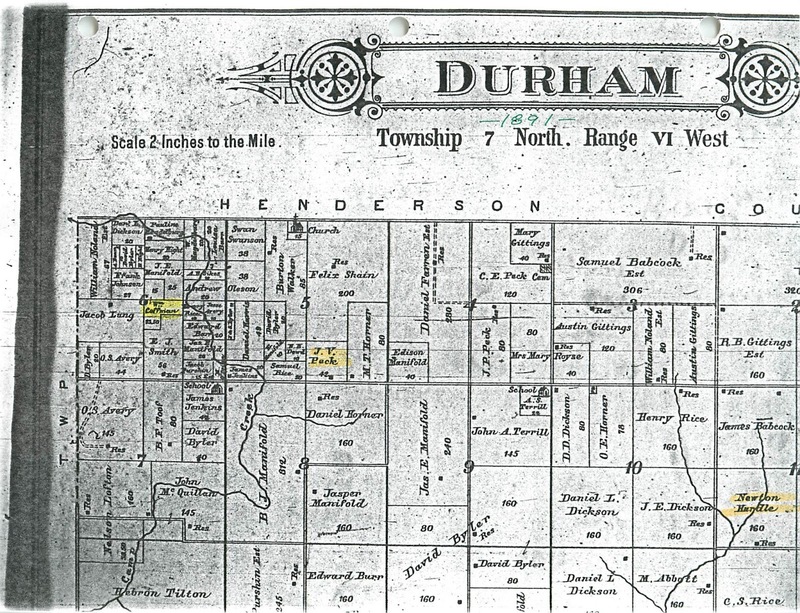 !LAND-RESIDENCE: 1874 Map of Durham Twp. north east quarter of section 34; Illustrated Historical Atlas of Hancock County, Illinois, 1874; Published by A. T. Andreas, Chicago, Illinois. pg. 70. 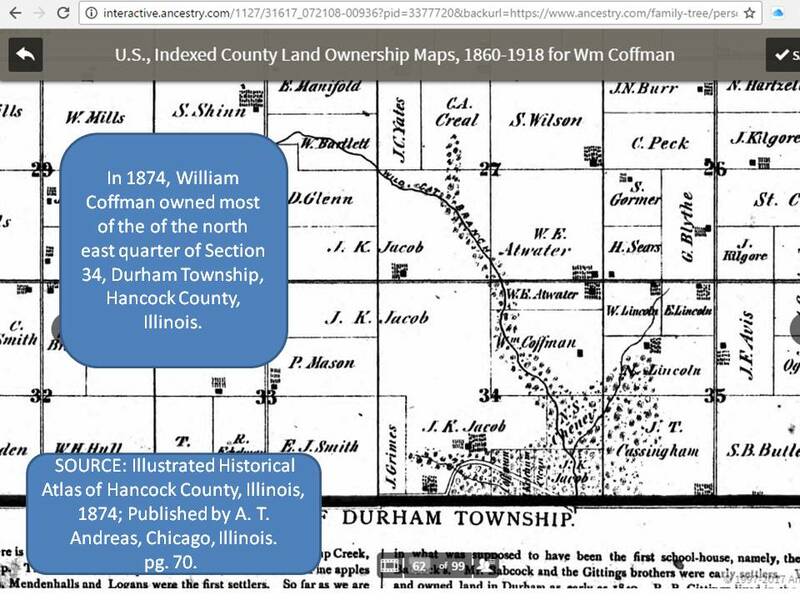 In 1874, William Coffman owned most of the of the north east quarter of Section 34, Durham Township, Hancock County, Illinois. !RESIDENCE: 1886 Durham Twp. 7N 6W, LaCrosse, NE 1/4 of Sec. 34; Directory of Hancock Co. Illinois, 1886; FHL 977.343 E4d. 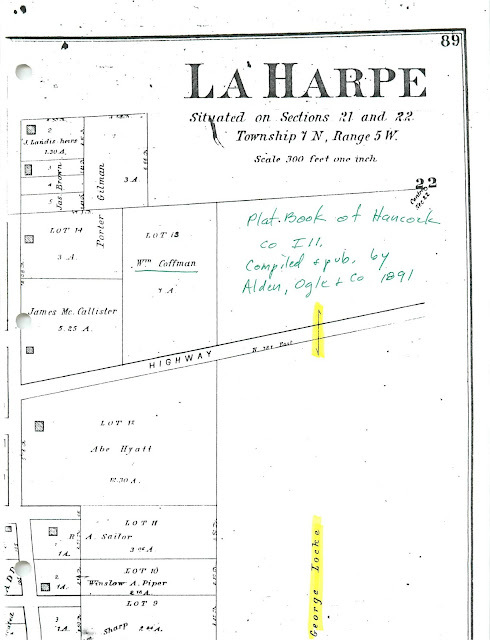 !RESIDENCE: 1891; William Coffman owned Lot 13 in La Harpe. This was adjacent to the George Locke property on the east and James McCallister property on the east and fronted the highway. He also owned a 23 acre parcel in Durham Township, Section 6. It was a portion of the northwest quarter of the Southeast quarter. E.J. Smith owned 56 acres of the west half of section 6 and bordered William Coffman on the south. SOURCE: 1891 Plat book of Hancock County, Illinois / compiled and published by Alden, Ogle & Co., page 89. !NEWSPAPER: La Harper 11 Aug 1893 Mr. and Mrs. J.M. Springer of Carthage, visited with Elias Brandon's family, at Blandinsville, Sunday and Monday and returning visited their good friends Mr. and Mrs. P.D. Williams and spent the night with their old Pilot grove neighbors, Wm. Coffman and family. John's visit about town was all too short. He has friends here by the score, who failed to meet him. !WIFE'S DEATH: Elizabeth Wilson Coffman, wife of William F. Coffman, died on 25 October 1893 at their home in La Harpe, Hancock County, Illinois. Her obituary tells a great deal about their life together. !OBITUARY: From the LaHarper or The Quill, LaHarpe, IL Elizabeth Coffman was born in Washington county, Kentucky, February 27, 1816 and died at her home in LaHarpe, Illinois, Oct. 28, 1893 at the age of 77 years, 8 months and 1 day. She was the daughter of James and Elizabeth Wilson. She came with her parents to Illinois in 1833. They settled in McDonough county in what was then known as "Jobe's Settlement." This became a typical pioneer home, the hearth glowed with genial warmth and all was hospitality and good cheer. Here in the bloom of womanhood, surrounded by parents, brothers, and sisters, she became affianced to a young man, also hailing from her old neighborhood, who had come out west to try his fortune and build up a family. The wedding took place Dec. 7, 1837 and she became the wife of Mr. Wm. Coffman. They were married by the Rev. John Logan, a worthy Baptist divine and one of the earliest pioneer preachers in Illinois. They started on life's journey with bright hopes and cheerful hearts. They resolved to make the most of the situation and to endure all the evils in order to enjoy the sweets of pioneer life. In 1841 they removed to Missouri, but four years later returned to Illinois, resolved to make it their permanent home. Mrs. Coffman became the mother of nine children, two sons and seven daughters, two of the daughters died before attaining womanhood and four, Mrs. O'Neil and Mrs. Earlywine, Eary Ettna and Luella preceded her to the better world, Mrs. O'Neil and Mrs. Earlywine leaving small children. Mrs. Coffman cared for these children during their tender age and lavished upon them the wealth of her motherly affection. Her two surviving daughters, Mrs. Dewitt and Mrs. Peck and one son, Alfred D. Coffman, live in Hancock county, and all have been most devoted to their mother in her last illness. One son, Archibald D. Coffman, lives in California. She also leaves her surviving husband. Faithful indeed have they kept their marriage vows. For over half a century have they loved cherished and assisted each other along life's journey. She was always kind and hospitable and with all possessed a cheerful disposition. In all the varied circumstances, come what might, she was equal to the occasion and maintained a cheerful mien and a happy spirit. These noble qualities endeared her to a host of loving friends and made her home agreeable and pleasant to all about her. She was a devoted wife a kind mother and a noble friend. From childhood to old age she had practiced those virtues which dignify human character and adorn the Christian. Those who knew her best loved her most. Let us keep her memory green until we too are called hence. Sarah De Witt was the daughter of William F. Coffman. She was born October 1840 in Illinois and she was a widow and had no children according to this census record. "This cemetery was established in 1849 at the same time that the Hillsborough Baptist Church congregation was organized. A frame church building was built immediately south of the cemetery and stood at that location for several years. Present condition of the cemetery grounds is good; the area is regularly maintained, well fenced, and most stones are in relatively good repair, although, many are badly weather-worn; some are broken. At least two stones were located that were completely unreadable due to wear and damage. " !OBITUARY: From the LaHarper, LaHarpe, IL 15 Sep 1905 William F. Coffman Died--At his home in this city, 8 o'clock Monday evening, Sept. 11, 1905, William Fowler Coffman, aged 90 years, 1 month and 13 days. William F. Coffman was born in Kentucky, July 30, 1815. When he was three years of age the family removed to Jefferson county, Illinois where they remained twelve years, when in 1830 they came to this vicinity where he has since resided. He united with the Baptist church at New Hope in McDonough county at 16 years of age and has been doing Christian service all through his life, not only professing discipleship but doing his Master's work to the best of his ability. None doubted his sincerity. There being no Baptist church near LaHarpe he united with the East Durham Christian Church in 1886, and later removed his membership to LaHarpe. He was zealous in Christ's cause, and a worker in the church. He had a kindly interest in his fellow man, recognizing the brotherhood that made all men akin. He was honest in action, honest with himself as well as with his God and his fellow man. His life was rightly lived from early youth and to this may be attributed the attainment of his many years and the good health he always has enjoyed. He was married to Miss Elizabeth Wilson in 1837. Eight children were born to them, four of whom are living. Mrs. Sarah Dewitt who has lived with him since the death of Mrs. Coffman some ten years ago. Mrs. C.C. Peck, now of Augusta, Archibald of Oakland, Cal., and A. Douglas Coffman of Graceville, Minn. There were born twenty-one grandchildren, fourteen of whom are living and fifteen great grandchildren. Mr. Coffman came to this city from South Durham about seventeen years ago. He has been quite feeble for a year or so and of late was unable to get around without assistance. Last Friday he fell from his chair and while it did not seemingly cause him serious injury, he rapidly declined and passed away at 8 o'clock Monday evening. The funeral services were held at the Christian church Wednesday morning at 10 o'clock, Eld. Huff officiating, and the burial was at Hillsborough, four miles east of this city. The floral offerings were beautiful. !WILL: Online will records were searched on 13 March 2017 but not record was found; "Illinois Probate Records, 1819-1988," images, FamilySearch (https://familysearch.org/ark:/61903/3:1:939J-K6Y2-3?cc=1834344&wc=SFKP-T36%3A162590601%2C163259501 : 20 May 2014), Hancock > image 6 of 358; county courthouses, Illinois. This was an index page for the "C" surnames.